Deliciously chewy cookies you can make in less than a half hour that are sure to provide you with all the healthy fats you need when following a keto diet? These cookies almost sound too good to be true. This dessert is a great healthy substitute for your traditional sugar cookie (or any cookie for that matter), because it’s made without one key component — sugar (don’t worry, they’ll still satisfy your sweet tooth!). 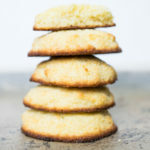 These Keto Coconut Flour Cookies are not only low in calories and carbs, but they make the perfect dessert to whip up before heading out the door to any special event. So what’s in these cookies that makes them the perfect keto treat? The ingredients in these cookies include egg, coconut oil, a low carb sweetener (Swerve), coconut flour, Perfect Keto MCT Oil Powder and a hint of baking soda and salt. All of these ingredients together yield about six cookies. One cookie comes out to a total of 131 calories, including 13 grams of healthy fats, eight grams of carbs, less than one gram of net carbs, and less than two grams of protein. Yep, you read that correctly — no more than one gram of net carbs per cookie. Keep in mind, you don’t have to use these specific ingredients for a great low carb cookie. If you don’t have coconut flour on hand you can use almond flour. This goes with the sugar substitute Swerve as well. Another great sugar substitute you can try is Monk Fruit sweetener. However, keep in mind that swapping out ingredients may create different macronutrient results. Cookies don’t have to be a stressful high carb treat that might kick you out of ketosis. In fact, with the healthy fats and lack of carbs found in these sweet treats, you’ll be sure to stay in ketosis all while satiating that sweet tooth. In a large bowl. whisk together the egg, coconut oil, and vanilla extract until frothy and light. Add in the Swerve and whisk to combine. Add in the rest of the dry ingredients and mix and fold until a dough forms. Line a baking sheet with parchment paper. Shape 6, even-sized balls, and set them 2 inches apart. Gently flatten them and bake for 10 minutes. Let them cool completely before handling. The post Chewy Keto Coconut Flour Cookies appeared first on Perfect Keto Exogenous Ketones.